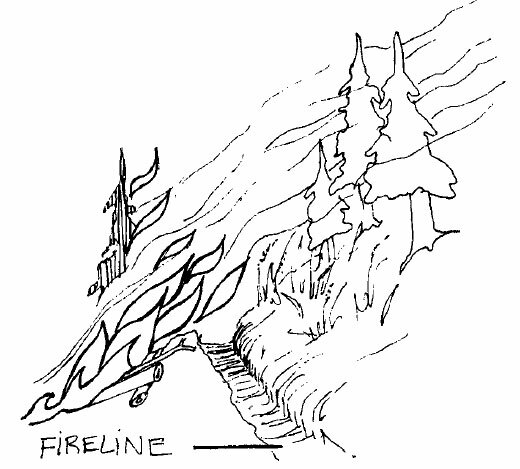 Make fireline no wider than necessary (see Figure 15). The time and energy saved by keeping firelines no wider than necessary to stop a fire can be better utilized in construction of more fireline to encircle or control the fire. Clean all fireline to mineral soil for all or part of width (see Figure 16). 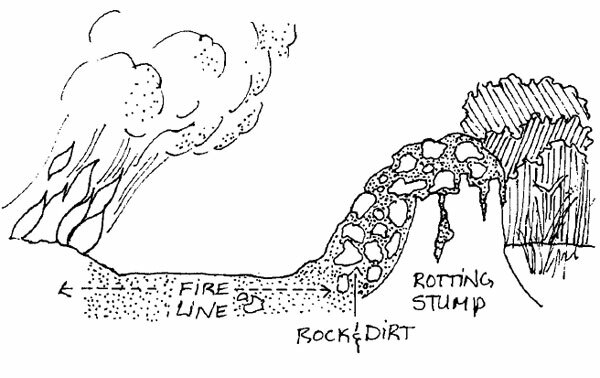 Cleaning a fireline to mineral soil prevents the fire from spreading through fuel across the fireline, particularly dead roots. However, constructing fireline to mineral soil may not be practical in some types of fuel such as bogs, peat, tundra, etc. Scatter charred or burning material from fireline construction inside the burned area. Unburned material from fireline construction is generally scattered outside the fireline. Unburned material can be scattered on either side of the fireline, provided this does not increase burning and heat at the line and make the line too hard to hold or complicate mopup; if fuel is needed for burning out, place inside the fireline. Underslung or undercut fireline is fireline constructed across a slope below the fire. Protect underslung or undercut firelines from rolling material by building a cup trench (see Figure 17). A cup trench is sometimes called a roll trench or "V" trench. Effectiveness of a given width of line can be increased by using dirt or water to cool down adjacent fire. 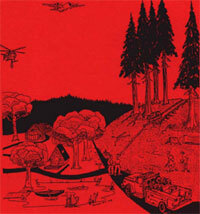 Fuels outside the fireline can be pretreated with retardant or foam, covered with dirt, or wet down. (see Figure 18). 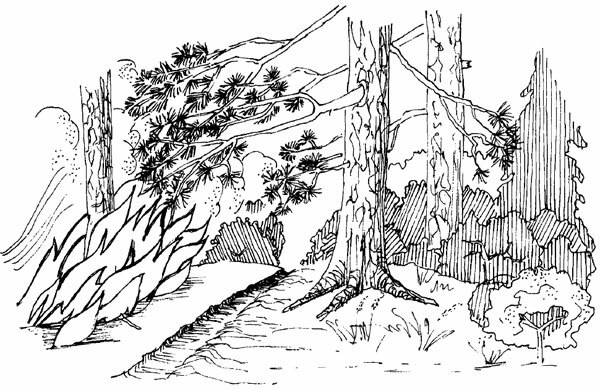 Remove low hanging limbs from trees on both sides of the fireline to prevent the fire from spreading across the line (see Figure 19). 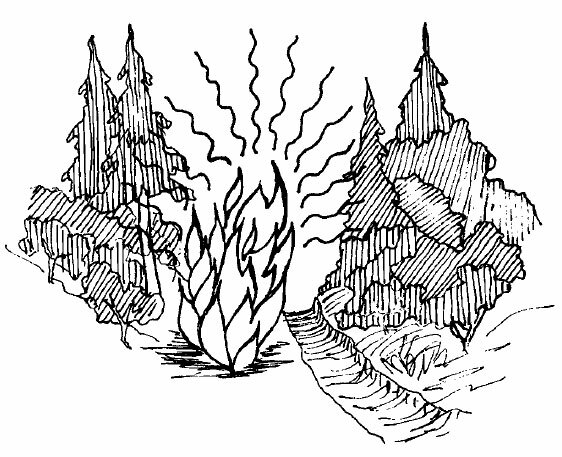 Heat can ignite fuel across or above the fireline even if flames do not reach the fuel. Radiant or convective heat may ignite fuel on the opposite side of a fireline which is too narrow or has too little overhead clearance. Radiation is transmission of heat through the air by rays. The heat may be radiated in all directions, horizontally as well as vertically (similar to heat radiated from a stove). Fuels too close to intense heat can be ignited even if they are not in contact by flame (see Figure 20). Convection is transmission of heat by currents of air. Convection currents preheat the fuel ahead of a fire (across and/or above the fireline) and make the fuel easier to ignite (see Figure 21). If too close, fuel can actually be ignited by convection currents. Anything that affects how a fire burns must be considered in deciding the width of fireline needed to hold or control a fire. The hotter or faster the fire burns, the wider the control line must be. 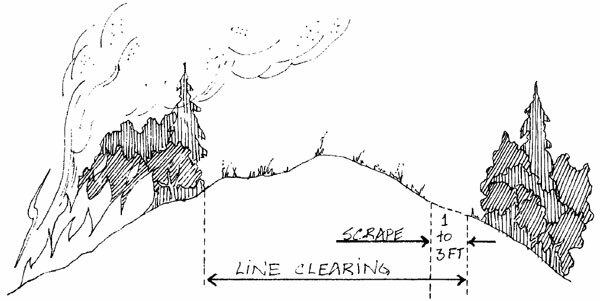 Six important factors in determining fireline width are: 1) fuel, 2) slope, 3) weather, 4) part [head, flanks, rear] of fire, 5) size of fire, and 6) possibility of cooling. 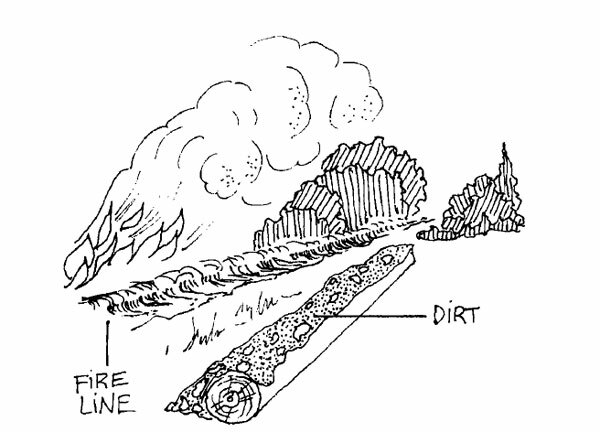 The width of a fireline is generally accomplished by clearing and scraping (see Figure 22). 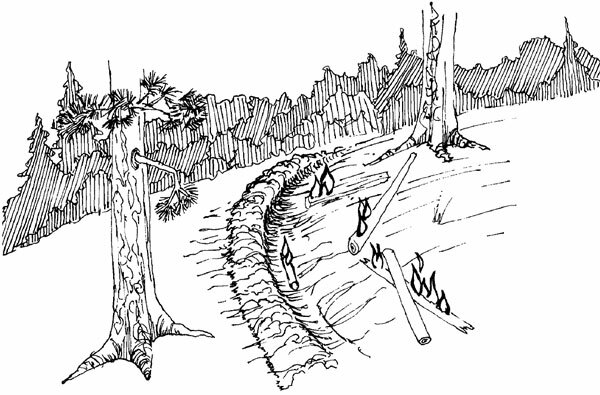 Brush, trees, and logs must be removed by clearing a strip wide enough to prevent the flames, radiation or convective heat or any combination of the three from igniting fuel across the fireline. All flammable material must be removed by scraping to mineral soil a strip wide enough to prevent fire from spreading through roots and other ground fuel across the fireline. The scraped strip must be placed on the outside (side away from the fire) of the cleared strip. A general guideline for determining the width of a fireline is that it should be one and one half times as wide as the dominate fuel is high. The scraped portion of a fireline is generally one to three feet wide. However, in timber a fireline is generally 20 to 30 feet wide with a three to four foot scrape. A fireline in timber should be constructed to stop the burning surface and lower aerial fuels. Most firelines will be unsuccessful in stopping a crown fire in timber.